From the director of Death Note comes Attack on Titan. Many years ago, humanity was forced to retreat behind the towering walls of a fortified city to escape the massive, man-eating Titans that roamed the land outside their fortress. This is their story. After the Titans break through the wall, the citizens of Shiganshina must run for their lives. Those that do make it to safety find a harsh life waiting for them, however. Eren begins his training with the Cadet Corps, but questions about his painful past overwhelm him. When he struggles with a maneuvering exercise, Berholt and Reiner offer kindly advice. Annie proves her skill in a sparring session, Jan dreams of serving alongside the King, and graduation day brings shocking revelations – along with a sudden outbreak of violence! Eren faces off against the Colossal Titan after it appears out of nowhere and knocks a strategic hole in the Rose Wall gate. As Titans swarm the city, the newly graduated Cadets are called in to fight in brutal battle that won't be without casualties. Armin tries to cope with the loss of his friends and allies after Titans massacre his squad. Elsewhere in the city, Mikasa manages to take out several of the monsters, which brings back tragic memories of her past and the first time she met Eren. After the retreat bell sounds, many cadets find themselves without enough fuel to scale the wall back to safety. Mikasa begins to lose hope once she hears of the deaths in Armin’s squad, but the appearance of a new type of Titan stokes her will to fight. 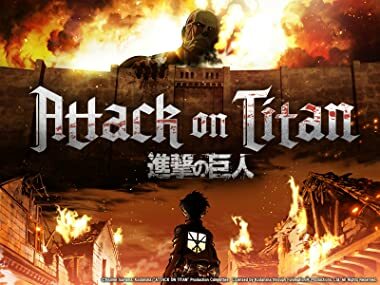 Armin comes up with a risky plan that pits Titan against Titan as the abandoned Cadets attempt to take back their headquarters. Getting into the building might be possible, but getting out alive and refueled will mean facing more of the giants. A miraculous return is met with anger and fear. Cannons are fixed on Eren as he struggles to remember what happened to him inside the belly of a monster and how he ended up humankind’s enemy. One question is all that matters: is Eren human or Titan? Cadets respond to Eren’s terrifying transformation with doubt and fear as he struggles to understand it himself. If Armin can’t talk the commander into using Eren’s newfound powers for the good of humankind, all hope of stopping the Titans might be lost. Plans are created to use Eren’s Titan powers to seal the hole in the wall in an attempt reclaim Trost. But with the government’s bloodstained history and vocal dissenters in the military ranks, the biggest threat to humankind may not be the Titans. The plan to reclaim Trost falls apart when Eren’s newfound powers turn him into a mindless giant. As Titans continue to swarm the city, it’s up to Armin and Mikasa to make sure the cadets massacred during the mission haven’t died in vain. Jean takes desperate measures to replace his broken maneuvering device. Meanwhile, Eren is able to plug the hole in the wall thanks to the help of his fellow cadets, but the cost of humanity’s first victory against the Titans will be gigantic. A special military tribunal will decide Eren’s fate. The Military Police calls for his execution while the Scout Regiment argues that he is a powerful resource for humankind, and Mikasa is put on the spot when asked about the events of the Trost mission. The Scout Regiment moves Eren to an old abandoned castle where he will continue his training. Hanzi visits and reveals that she’s been putting two captured Titans through a series of tests and trials—experiments that she wants Eren’s help with. Everyone is a suspect in the investigation to find out who killed the two test-subject Titans. Meanwhile, the Cadets pick which corps they’ll be joining, but after the harrowing events in the Trost attack, many are uncertain which branch to choose. As the Scout Regiment begins its push toward Shiganshina, they encounter an intelligent Female Titan unlike any they’ve seen before. When Armin hypothesizes that it’s really a human that’s been turned into a Titan, he, Jean, and Reiner attempt to stop it. As the Female Titan continues to tear its way through the Scout Regiment, Levi makes a bold decision to split the ranks and send Eren and the supply wagons through a huge forest. Is his strategy genius, or does it spell certain death for the scouts? A memory of Eren testing out his Titan powers sheds new light on how his abilities work. As the Female Titan continues to slaughter members of the Scout Regiment, Eren is faced with a difficult decisions: does he trust his teammates or act out on his own? The Female Titan has been captured, and it’s Erwin’s goal to find out who the human is lurking inside it. Meanwhile, the Scouts realize that the reason Levi told no one about their true mission outside the wall is because there is a spy among their ranks. A traitor has infiltrated the Scout Regiment, destroying their ranks from within. When cornered, she once again takes the form of the Female Titan—but this time, Eren’s not going to let her get away without one insanely brutal fight. After watching Eren get swallowed by the Female Titan, Mikasa and Levi follow the brutal monster in the hopes that he’s still alive inside her. As the Scout Regiment tries to recover from the devastating losses of the operation, emotions run high. After the failed scouting expedition, Eren and his superiors are summoned to the capital. Annie witnesses just how deep corruption runs in the Military Police, and agrees to join Armin in a plot to defy the government - but nothing is really as it seems. When the identity of the Female Titan is finally revealed, she goes on a rampage within Wall Sina. Eren is hesitant to fight her, but Armin and Mikasa throw themselves into of the battle in a desperate attempt to stop the towering monster. Eren goes head-to-head with the Female Titan in a fight that demolishes the Stohess District inside Wall Sina. As the number of casualties skyrockets and Annie tries to escape over the wall, Erwin must deal with the consequences of his plan.